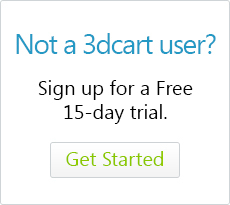 When you upload a main image to your product, the 3dcart software will automatically create a thumbnail image for it. The thumbnail image itself is created to conform to a set size that is specified in your store's settings. The default for this size is 150px which is usually fine for most themes. However, some of our responsive themes are tailored to showcase products on the home page with a larger area for thumbnail. Therefore, the default thumbnail size will appear small when using these themes. Here are a couple of things you can do to correct this. The first suggestion would be to change your store's default thumbnail image size to something a little bigger. Then, use the store software to re-create your thumbnail images and see if that looks better on your theme with a larger size. Then, click on the "Product Display" tab located along the top of the page. Within the "Products" section you will see two fields under "Thumbnail Image Size." Typically, these will both be set to 150. Click "Save" at the top right to commit your settings. The suggested size of 250 is merely a suggestion because its 100 pixels more than the default size. Feel free to experiment with different sizes as you see fit. This setting will make it so that - as you upload images for your products - their respective thumbnails will be created within these dimensions. However, we still have to deal with your current thumbnails so let's quickly resize those. Locate the item you'd like to edit and click on its name to open it up. Finally, hover over your product's Thumbnail Image and click on the "Create from Main Image" link that appears. This will recreate the thumbnail, but this time it will use the dimensions you specified in the previous steps. Repeat this for each item on your home page and check to see if your results are satisfactory. Feel free to alternate the sizes on the thumbnails larger or smaller as needed to get the look you desire for the home page. In some cases the size of the thumbnail is determined byt the store's HTML coding. If following the steps above still doesn't change the size of your images, then you may need to add some coding to your store's frame file to correct this further. Look towards the top right of the screen and click on "Edit Template (HTML)"
This will take you to your store's template folder. As with the general store setting, feel free to edit the 250px to meet your needs. Then click on View Store to see how the new image sizes appear on your store.